Married Passions is a free dating site for married couples interested in making new friends. Join for free and take advantage of free email, chat, forums and more. eharmony uses proven matching technology to screens hundreds of thousands of people to find only the ones that are right for you. 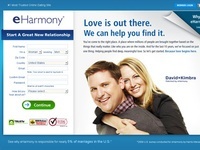 If you are serious about finding the person who is right for you, eHarmony is worth a look. "Kupple.com is an online community where you can meet other couples seeking friendship, sharing your hobbies, or simply looking to try out that new restaurant. Find interesting couples in your new town. Expand your circle. Maybe even meet your new best friends..."